by Marty MayerPublished February 24, 2016 May 19, 2017 1 Comment on Is History Repeating Itself? Over the last few weeks, the spotlight has been on the devastating budget deficit facing the state of Louisiana. Lawmakers are contending with a budget shortfall ranging upwards of $950 million with only 4 months to close it. But Louisiana’s budget deficit is not a new problem. In fact, over the past 10 years, we have seen the same issue time and time again. History is repeating itself and it’s time to find a long-term solution. Our budget difficulties stem from a combination of significantly less state revenue—the decline in post-Hurricane temporary economic growth and federal recovery funds, the onset of a national recession, and the sharp decline in oil prices—coupled with years of poor decisions and short-term fixes on behalf of our elected officials. So here we are, in yet another crisis being heavily—and very publicly debated. We are hearing scare tactics and rhetoric from both sides. Governor Edwards’ plan is to create new revenue from taxes, while many Republicans are advocating for substantial changes in the Louisiana budget structure as a whole. The answer is a balance of both. Did you know Louisiana’s budget is 44% larger than it was 10 years ago—and our state spends more per capita than any other state in the South? In addition, most of Louisiana’s $25 billion state budget is considered off-limits to annual review or reductions. This budget structure must be reformed. Click here to read more startling facts on Louisiana’s budget problems. Now, the Governor is proposing as much as $2 billion in new revenue from taxpayers to fund state and local government to continue to operate, but raising revenue alone is not the solution. While I agree that prudent tax increases are inevitable at this point, before lawmakers look to taxpayers to fill the budget gap, I would encourage them to look within and #FixGovtFirst. It is critical that short-term fixes do not have negative long-term impacts on our state. We have had too many made in the past that we are still struggling with. Right now, we have a unique opportunity to address these budget issues and prevent this historic cycle from repeating itself. For example, one specific revenue that can help is e-fairness legislation, such as the Marketplace Fairness Act, that would provide for the collection of state and local sales tax on Internet purchases. 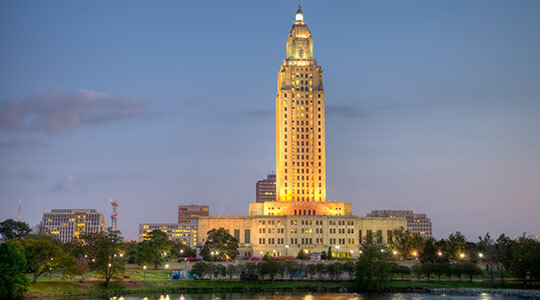 Several sources estimate that Louisiana and its local governments lost nearly $400 million in 2012 from foregone Internet sales tax revenues—and possibly considerably more in the current year as more consumers turn to the Internet to purchase goods and services. These dollars could go a long way in reducing the state’s crippling budget deficit. This is not a new or increased tax, just a loophole in the law. Under current legislation, consumers and businesses are required to pay sales and use taxes on the goods they purchase, but they are simply not—98% of people choose not to pay or report electronic purchases. Contact your representatives and make your voice heard. Two bills on e-fairness legislation, House Bills 6 by Rep. Steve Pugh, R-Ponchatoula, and 30 by Rep. Walt Leger, D-New Orleans—and as many as 100 others—could be reviewed by the House Ways and Means Committee as early as this week. Click here to learn more, see recent legislative updates and Take Action by emailing elected officials about your priorities. Tell #lalege it’s time to #FixGovtFirst. Thank you Marty for sharing this insightful and disturbing information. It is time for reform not only on the national level but all the way down to the local level. The voters are angry and hopefully will stand up and vote for reform.